re volt - split kiteboard "better die like a player, than live like a loser" The name says it all. Re volt defies all the prejudice towards split kiteboards. We have designed one of the best split kiteboard on the market using the most advanced technologies, making it ultra-compact and compatible with wake bindings. The unique A-Lock System concept marks the milestone in kiteboard technology, endowing the split kiteboards with advantages on all levels. Compare to the re solve split kiteboard, the properties of re volt make it a more freeride-oriented one. The absence of carbon fibers increases its flexibility and gives it a softer feel while not losing in strength or grip. 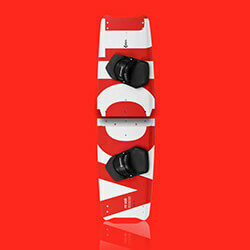 Re volt, a versatile split kiteboard to exceed your every expectation. "better die like a player, than live like a loser"
The name says it all. Re volt defies all the prejudice towards split kiteboards. We have designed one of the best split kiteboard on the market using the most advanced technologies, making it ultra-compact and compatible with wake bindings. The unique A-Lock System concept marks the milestone in kiteboard technology, endowing the split kiteboards with advantages on all levels. 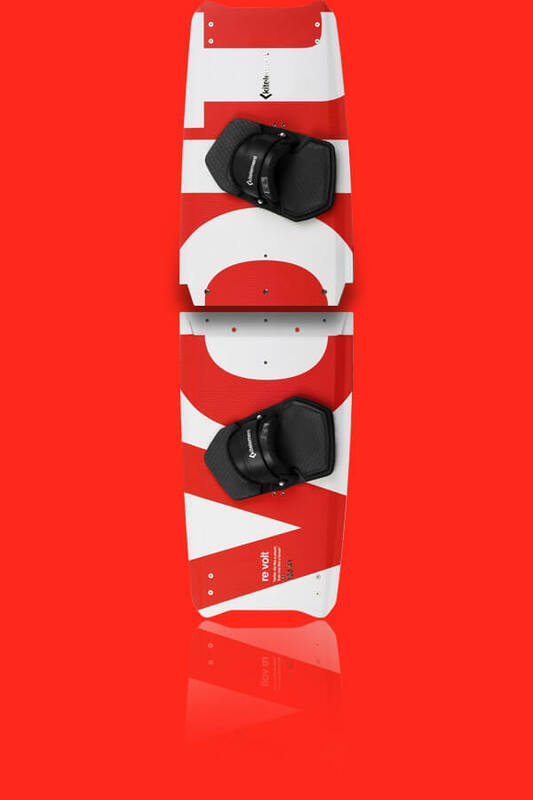 Compare to the re solve split kiteboard, the properties of re volt make it a more freeride-oriented one. The absence of carbon fibers increases its flexibility and gives it a softer feel while not losing in strength or grip. Re volt, a versatile split kiteboard to exceed your every expectation. Highly resistant foil coating, polyurethane side walls, adaptable bindings and 3D profiling – these are some of the many benefits of the re volt split kiteboard. The heart of the split kiteboard is created with a specially shaped joint lock system using full-carbon slats embedded in the wooden core. This unique solution adds only a little over 3cm to the overall length of each half of the kiteboard and ensures a perfectly even distribution of pressure from the central part to the tips. The applied 3D profiling permits for the screws to be embedded into the body of the split kiteboard on both sides. Even small nuances can have a large impact on the overall surfing experience and so does the leading dual channel system. Its location delivers a noticeably better directional stability. Polyurethane side walls represent innovation in the form of edges - several degrees harder compared to the more common ABS. Polyurethane material is also much less susceptible to delamination. Ultralight bindings are equipped with a specially designed active memory foam which adapts comfortably to the shape of your feet. As a result, each owner's individuality will be imprinted into his or her bindings. In principle, each footpad will be re-shaped precisely according to your foot in a couple days and the foot strap will be re-shaped precisely according to your instep. Highly resistant CNC shaped fins from G10 material come in 40mm and are the ideal choice when looking for the fusion of playful kiteboarding and great upwind abilities. The ultra-dynamic rocker represents dynamics in the true sense of the word. It delivers an unbelievable energetic pop with smooth and continuous onset. The emphasis put on the precision during rebounds is obvious even when tackling the most advanced "new school" tricks. Re volt comes in three sizes, is usable in all wind conditions and suitable for all weight categories of kiters.